This week has been pretty crazy with the drama surrounding BSV and the overall uncertainty in the market. One thing is certain, BSV is the project that took the biggest loss(-34%) and will probably continue to do so. Today, we will not be focusing on the losers, we will focus on the gainers within the top 25 in terms of market cap. The biggest gainer of this week is LAMB, a project that I recently came across. The project is based in China and is focusing on providing a decentralized storage solution with unlimited scalability. According to CoinGecko, they have a $100m Market Cap and a total supply of 6b, with only 1b in circulation. The project has gained 77% value this week. Another project on fire is Crypto.com, its price increased by 45% in the last 7 days. CRO has a Market Cap of $417M and a total supply go 100b(only 5b are currently in circulation). The price is on the rise due to the latest news, which includes card payments and crazy profits for staking CRO for a longer period of time. The third gainer of the week is Tezos with a Market Cap of $903M and a total supply of 791M. If you have been following my articles, I talked about Tezos crazy price surge a few weeks ago (click here). It has done pretty well since then and it went past my expectations. Tezos increased by 22% in value this week. 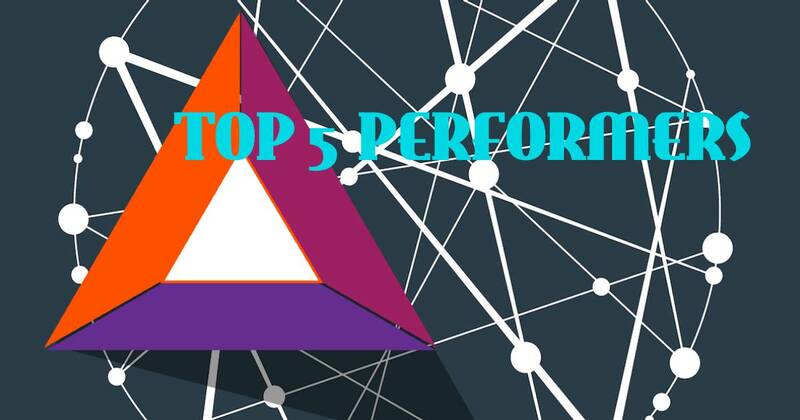 The 4th on this list is Binance Coin with an increase of 8%. BNB has a Market Cap valued at $2.83b, with a 188M total supply of which 144M is currently circulating. BNB seems pretty stable and it should continue to gain value in the near future because Binance is a leading crypto exchange that keeps pushing hard toward innovation. Last but not least, Basic Attention Token. To be honest, that name has always been amusing to me. BAT remained on the gainers’ side with an increase of 7.9% this week. It has a Market Cap of $411M and a 1.5b total supply of which 1.2b is circulating. BAT has been on the news lately and I am going to go a little bit deeper into this. We know so far that BAT is now a Verified Brave Browser and a lot of bullish predictions are currently being made. But, what does TA has to say? Well, BAT’s chart looks similar to Tezos, however, it is not as “aggressive” I may say. They are both tight to BTC and they both have nice reactions to it. Due to the latest news and hype coming in, I expect that to change and BAT should become more “aggressive”. If you think about it, the supply is less than double when compared to Tezos and the current Market Cap is less than half. 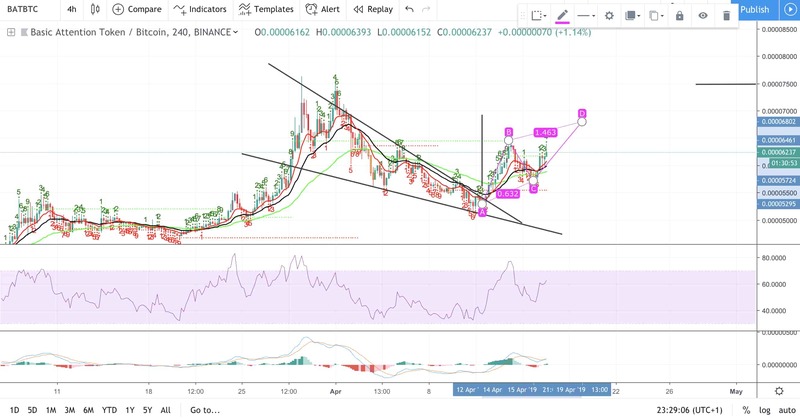 I expect BAT to be at least 9-10k Sats in the short term. If we have a look at the daily chart, everything looks pretty good. The RSI indicator has plenty of room until the overbought area while the MACD indicator is about to cross bullish. 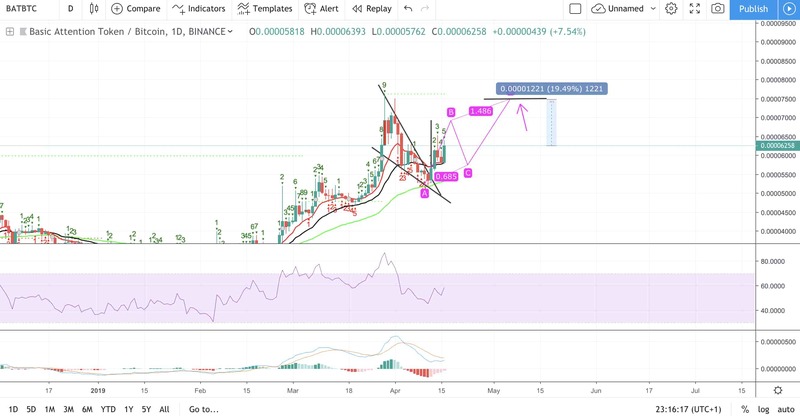 We also have a wedge that broke bullish, however, it didn’t reach its target of around 6.9k Sats yet. When if/it’s reached, I would look out for the ABCD pattern, in case it will happen (I doubt that). It may just continue its move up(depends on BTC really). On the 4-hour chart, the MACD indicator already crossed bullish, and we can clearly see an ABCD pattern that seems to take place. Remains to be seen whether or not it will be validated. As mentioned above, If BTC does well, I’d expect at least 9-10k Sats from BAT. Note: Please, keep in mind that this is not financial advice, it is just me sharing my opinion. I am not a financial advisor. Always make sure to do your own due diligence before investing. The writer does not hold any of the coins/tokens that have been mentioned above.